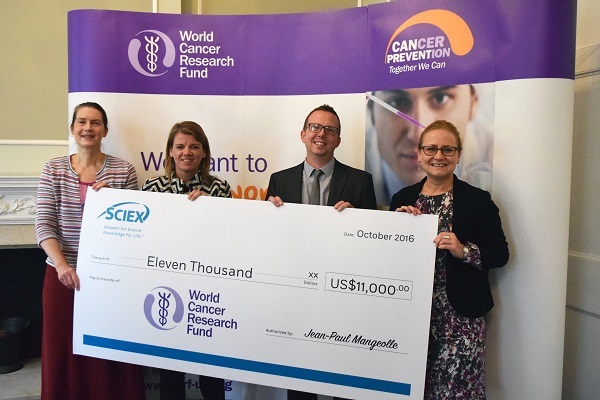 FRAMINGHAM, MA — SCIEX a global leader in life science analytical technologies, has today announced its donation of US$11,000 to the World Cancer Research Fund (WCRF), which funds and supports vital scientific research into cancer prevention related to diet, weight and physical activity. This money was raised through SCIEX’s strong employee participation in the company’s annual engagement survey, where SCIEX committed to making a donation to this very important cause based on the number of survey responses collected. The WCRF cause is aligned with SCIEX’s vision of placing the power of life-changing answers into the hands of those who care, everywhere. The WCRF initiative is SCIEX’s latest contribution towards accelerating cancer research through providing the critical tools, expertise and partnerships that are urgently needed for developing more effective cancer therapies.